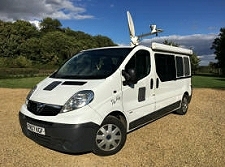 VSATlive supplies SNG trucks and LiveU uplink in UK. Stoke Rochford, UK, September 2016: VSATlive - based in the Midlands and south-east England - is a newly-formed company offering broadcast facilities for news and sports coverage. It owns unbranded SNG trucks capable of streaming HD video via LiveU, Quicklink and Mobile Viewpoint over KA-Sat. The Ka-band system it uses is Eutelsat's NewsSpotter network. The company says, "We use KA-Sat to provide extra resilience so we can go 'live' from remote locations that otherwise might not be served by the 3/4G network." The trucks are equipped with IFB and wireless camera links. They also offer access to the internet whilst on the move. VSATlive states, "Our Wi-Fi service automatically switches to a backup internet service provider in the event of loss of signal. This means you remain in constant contact with your office and ahead of the competition whenever there is a fast breaking news story." The company has two portable LiveU kits available for hire. One is based in Kent for fast access to London and northern France and the other is located near Grantham which is in easy reach of East Midlands International Airport for connecting flights to Europe and beyond.